Desperate to use up the juice crowding our fridge, I stumbled across this very cool technique for making a creamy sorbet out of any fruit juice. All you need is juice, sugar, water, and one intact egg. You don't even need an ice cream maker. Gather the kids 'round for this one. It’s science in the kitchen, folks! 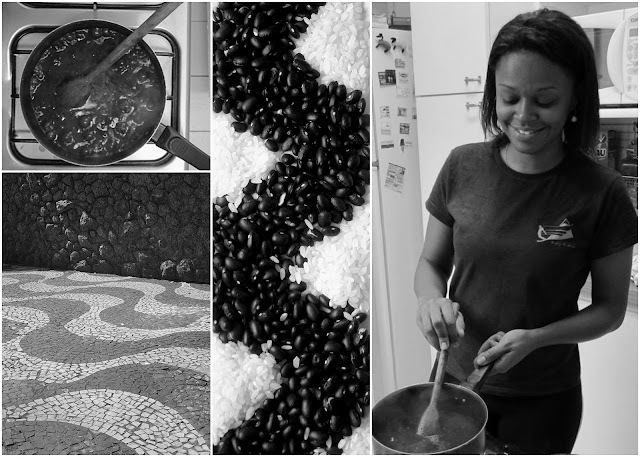 Read Zoë François' post on Sorbet 101 for the full details. In brief, here’s how it works: An egg that normally sinks to the bottom of a bowl of juice will float if enough sugar is added. 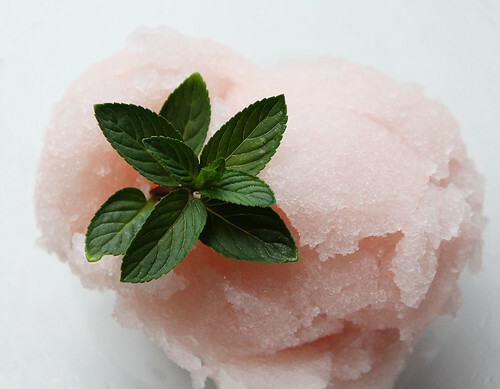 The amount of sugar needed to make it float happens to be just the amount you need to get a nice, smooth sorbet instead of a chunky, icy one. Out of a half-dozen juices stuffed in my fridge, thanks to my kindergartner’s recent science fair project on cleaning pennies, I chose blood orange juice for my first test. Ferry Farms’ oranges had brightened my table throughout the gray days of winter. By mid-March, I thought I was finally over citrus for the season. 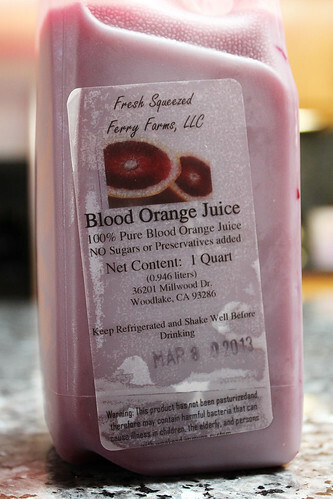 Then I tried their blood orange juice at the farmer’s market, went weak in the knees, and brought it home. The second ingredient: simple syrup. I simmered equal amounts of water and sugar until the sugar dissolved, then let it cool. I strained and poured the mixture, chilled it in the fridge, then let the ice cream maker work its magic. The final result: perfect. Mouthwateringly wow. The boys helped make a second batch, this time blending cherry and regular lemonade with a splash of limoncello. We needed less than a cup of sugar syrup to get our egg floating nice and high. I froze this one in a deep dish, stirring every half-hour or so until it was the right consistency and blitzing it with an immersion blender once it was good and slushy. Oh, my. This is good stuff. The guava juice is next in line for sorbetification, and then I want to try Cold-Brewed Iced Coffee, green tea, Lavender Lemonade, rosewater, herbal infusions, vegetable juices — maybe even beets? It's going to be a crazy summer around here. Thanks to Zoë Bakes for the brilliant technique. Be sure to read her post for more tips, including using tart citrus juices. If you have leftover simple syrup, refrigerate it for the next batch or use it to sweeten iced tea or coffee. You can easily make more less — the magic egg will make sure you have the perfect ratio. To make simple syrup: In a small saucepan, combine sugar and water over medium heat. Bring to a boil, stirring until sugar is dissolved. (Optional: For added flavor, add citrus zest or herbs and let them steep. See the Lavender Lemonade recipe for an example.) Cool. 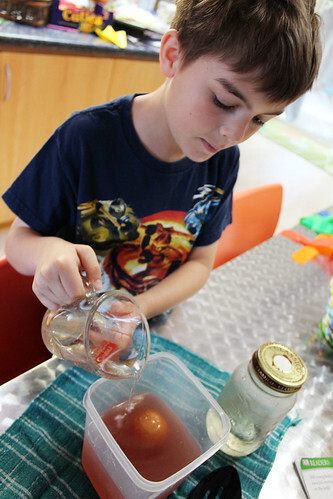 Pour juice into a container deep enough to fully submerge an egg. 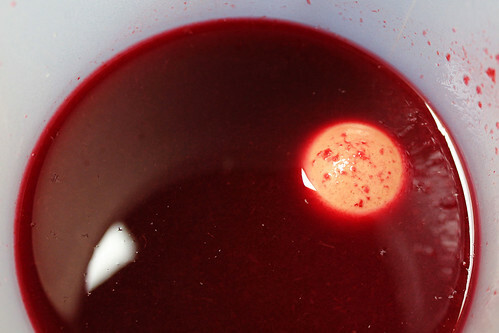 Carefully lower the egg into the juice and make sure it sinks. Remove it and stir in a quarter cup of cooled simple syrup, then add the egg again. Repeat this step until the egg floats — the part above the juice mixture should be about the diameter of a quarter. Strain mixture into a container and refrigerate until well chilled. Pour into an ice cream maker and prepare according to the instructions. If you don't have an ice cream maker, pour the mixture into a deep container and stick it in the freezer. Check on it every 30 minutes and stir until smooth. If it gets too chunky, use an immersion blender or a food processor to make it nice and smooth, then freeze again. It should take 2 to 3 hours total. 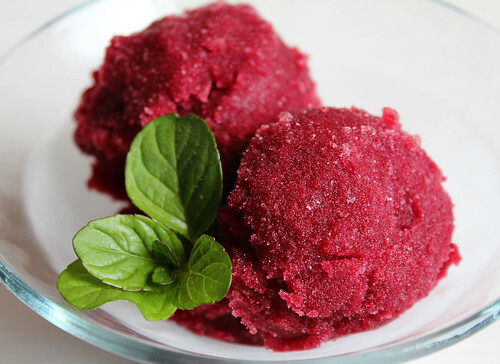 I was exactly trying to find out how to make sorbet, and, here it is! Thank you! So glad I had such good timing, Myrna! I hope it worked well for you.